In a saucepan, bring 2 1/2 cups water to a boil. Add the rice and cook for 15 minutes. The rice should still be quite firm. Drain and transfer to a bowl. Lightly beat one of the eggs and add to the rice, along with the grated cheese, parsley, 2 tablespoons of the tomato sauce, and salt and pepper. Mix well. Chill the mixture in the refrigerator for about 15 minutes. in another bowl, mix the mozzarella cheese, ground beef, peas and the remaining 2 tablespoons tomato sauce. With floured hands, divide the rice mixture into 4-6 portions and roll each portion into a ball the size of a small orange. 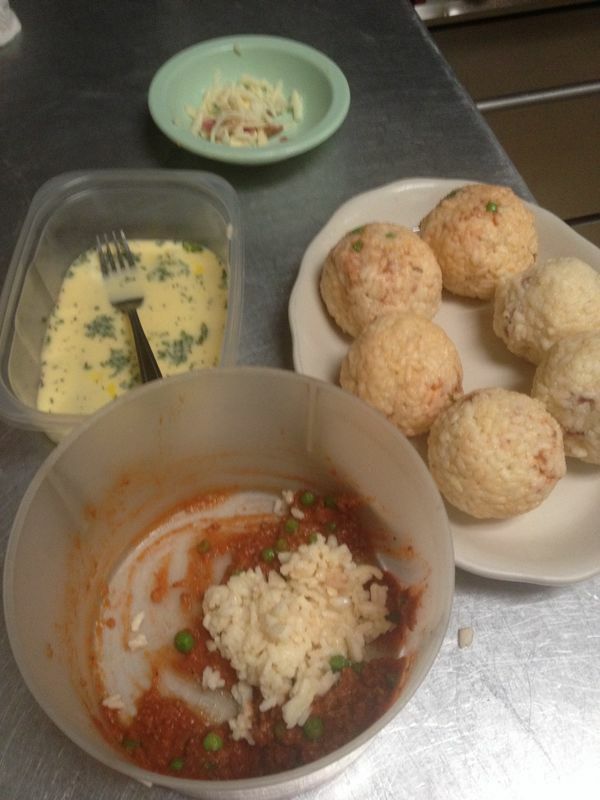 Poke a hole into the center of each ball with your finger and insert about 1 1/2 tablespoons of the mozzarella mixture. Reshape and smooth the balls to enclose the filling. In a shallow dish, beat the remaining 2 eggs. Spread the bread crumbs on a plate. Dip the balls into the eggs, turning to coat them well. 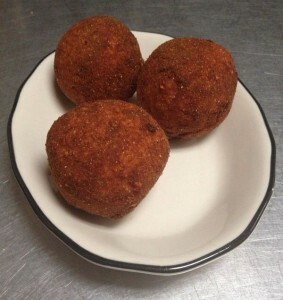 Roll the balls in the bread crumbs to coat them evenly. Then let them dry on a plate for about 45 minutes. In a deep fryer or deep heavy pan, heat the peanut oil to 375F. Fry the balls until they are golden brown on all sides. Drain them on brown paper and serve immediately, with lemon wedges or the fresh tomato sauce.